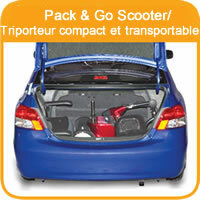 The easy-to-use Airgo® Pack & Go Scooter’s lightweight, compact design allows it to fit into the trunk of your car, so you can take it with you anywhere you want to go. What’s more, it assembles in just minutes and comes with everything you need packed in a box. •	1 Year warranty on frame, electronic controller, and drive train components. Please note: Your revision number is located under your seat.